Happy Monday friends! How was your weekend? I feel like it’s been busy, busy lately but all good things like birthdays and sports and fun things for the blog! You guys might laugh at me, but one thing I did on my birthday was organize my pantry! What can I say?! I just finally couldn’t take the mess anymore! Our pantry serves double duty as dry food storage, entertaining and decor items, and it’s where all the cardboard boxes and recycling lives before it makes its way to the bins outside. After the holidays and a few parties, it was overflowing and it’s been a couple years since it got a major clean out! Earlier this week I shared a snap of my home office on Instastories and got lots of questions about my home office. I didn’t realize so many of you hadn’t seen it before, so I figured I’d share it here again, along with some updates that have been done since the room was originally designed last summer. I haven’t tired of it and still pinch myself that I get to work here! I’ve worked in some pretty drab offices in my day, so this is a heavenly place for me to get to sit at and write to you each day! Hi friends! Back from a rather uneventful weekend, but those are necessary once in awhile, right?! On Saturday, while my husband was out and James was at a friend’s house, I took Jordan to the pool, just the two of us, and we had the best time! She is definitely a water baby and loves the freedom to splish splash to her heart’s content in the pool. At home, she’s always hearing, “nooooooo” when she’s splashing the bathwater all over the place. The girl has no fear and especially loves the pool sprinklers that splash right up into her face! It’s so fun to watch her get such a kick out of that! Once you have more than one kid, it’s harder to make sure you get one-on-one time with each, so this was a great time for us. I just got that new swimsuit and it’s darling (especially flattering in the back, but on the sexier side) and the colors are gorgeously vibrant. Back at home, one giant chore that’s been nagging at me was cleaning out and organizing Jordan’s closet and I finally got it all finished! Those organizing chores bring so much satisfaction when they’re done! I told my husband, “go look at Jordan’s closet” because I wanted to show it off, but I don’t think he understood the goodness of it- so thankfully, I have you! Babies grow so fast, so all those too small clothes had been piling up, and many were still on hangers, so I always had to avoid those when choosing her clothes each day. We’ve been generously gifted many awesome hand-me-downs that were too big at the time, but I had a suspicion that there were lots in there she could wear now or soon, so I needed to go through those too! After we were done, we had a nice and neat, clean closet with everything easily identifiable by size! While the majority of our household organization is my territory, even my husband gets the urge to clean out and organize in the new year! 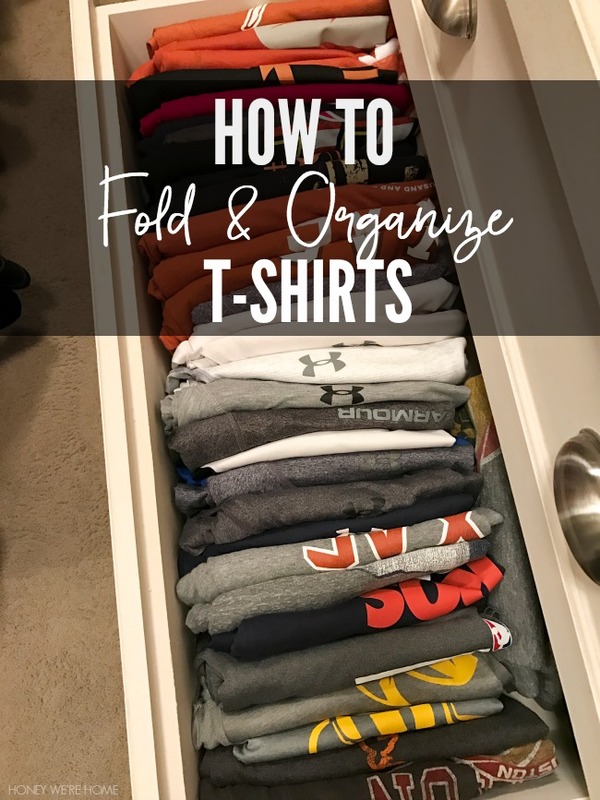 He’s been on a roll with his home office and closet #gobabe!, and I thought it might be useful to you if I showed you how I organized his t-shirt drawer. Are y’all getting settled into the new year? We’ve gotten all of our Christmas decorations taken down, and truth be told, I would’ve actually loved to keep them up longer! The last thing to go was the Christmas cards and we always save them to look through and see how all the kids have grown and changed over the years. I’m a new convert to holiday decorating at least some portions of our home before Thanksgiving now because I enjoyed it so much this year! I will be ready again for the holidays next year for sure! And I packed everything away really neatly so it won’t be so daunting pulling it back out! This last full week before school starts has me vacillating between I’m so ready for school to start and get back to some semblancy of law and order again!! and Noooo, it’s not long enough and I’m gonna miss James soooo much when he’s gone all day! Can you believe we start back so soon? Most schools in Houston start around August 22, but we start on the 10th! Until school starts, I’m not beginning any new projects, just recapping some of the most popular posts of 2016 so far. After all, there’s still 5 more months to go and a list a mile long of things I still want to accomplish before the year ends. Playroom Toy Organization & Let’s Meet! And just like that, it’s back to Monday again! Some weekends just fly by and this was one of them. I started working on Jordan’s “transitioning to the crib and sleeping through the night” post, so I’ll have that to you soon! Since it’s been several weeks now, I’m starting to feel like it’s not a fluke! #praisetheLord And guess what?! She’s five months old today! I can’t believe it! I just wrote her 3-month old routine yesterday! This weekend, we did manage to create some toy organization in the playroom/media room that I’m all giddy about. 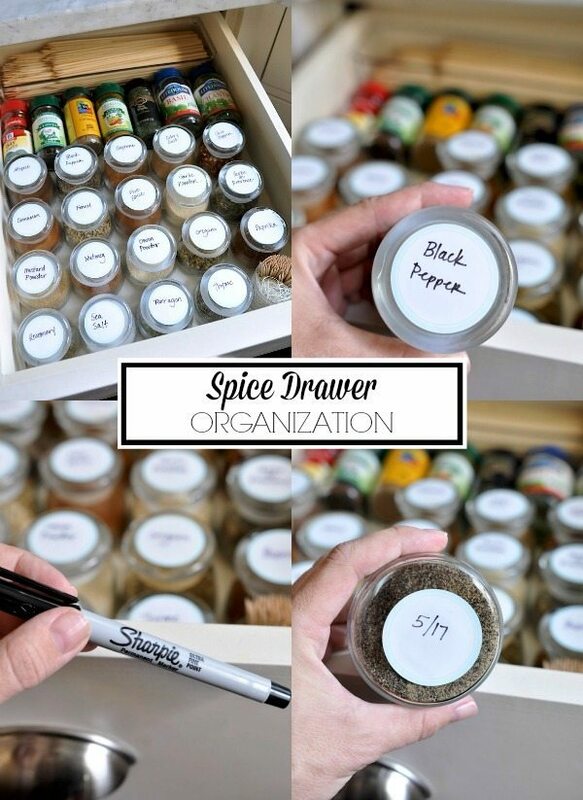 Yep, like I said yesterday, nesting is in full gear over here and after I organized our spice drawer, many other drawers were begging for a little refreshing too. I’m not sure anyone in my household really appreciates our newly tidied spice drawer, but y’all are my people, so I bet you will! Things like this get us giddy and no one else has to understand, right?! Thank God for each other- this is what caused me to start blogging in the first place when I was a new SAHM and needed women like you to relate with! This mini project was inspired spur of the moment while I was preparing a crock pot meal and having to add many spices that were past their prime or I was having to reach into both the drawer you see here and the cabinet above to find what we needed. This post is sponsored by The Home Depot. 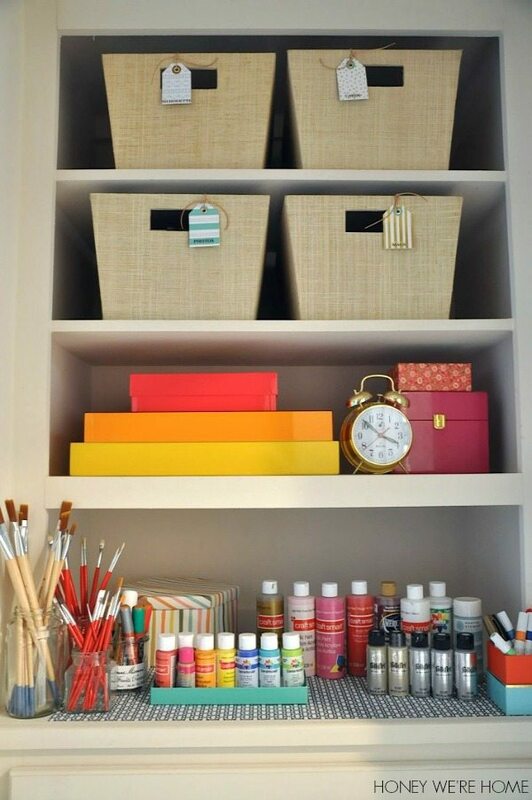 Although I often share my organizing tips with you, it’s been a long time since we’ve chatted about cleaning tips. I admit to being a “neat freak”, but I’m a neat freak who also appreciates and enjoys living in a home where you know kids are present. So, while we tend to have those little boy messes to contend with, and lots of legos found in the most interesting places, for the most part I like to keep our house clean, clean, clean. Our morning and evening routines are still in full effect (most days) and I’ve come to rely on waking up to a semi-clean house. If you read yesterday’s post about the process of Decluttering & Selling Books, you are ready for Part 2 today, the actual reveal of our newly tidied up spaces! I mentioned yesterday that, after reading The Life Changing Magic of Tidying Up: The Japanese Art of Decluttering I got to work tidying our linen closet, kitchen drawers, and also got a big start on our playroom. But, the newly decluttered and organized BOOKS is what I’m showing you today! Cleaning out and organizing our linen closet prompted many other organizing changes throughout the house. One new idea I’m excited to share with you is a quick and easy way to organize your purses and tote bags. I don’t know why I never thought of this earlier, but it finally occurred to me to hang them from the rod on shower hooks so I could easily see them at a glance. Before I organized and hung them, some were hanging on the back of my closet door and others were stuffed into cubbies. I like this way much better! It’s probably a combination of school starting again and moving our son from his nursery into the larger guest room that has prompted a major purge, organization, and cleaning session lately. That, and I’m reading The Life Changing Magic of Tidying Up. I’m already an organized person by nature so I wasn’t sure this book would make any difference in my life. But it has! I’ll share more on that later. This weekend, I worked on three kitchen drawers, the linen closet, the massive amount of books in our house, and the paper clutter. No wonder I’m starting this Monday morning off tired! My magazine tear sheets were getting out of control. I’m an active magazine/catalog reader, meaning I’m not afraid to circle things, make notes, and tear out pages for inspiration for everything from home decor to health and fashion. These images and articles can be a jumping point for future blog posts and now I’m also starting to get gift ideas for Christmas, so I wanted to get them organized. 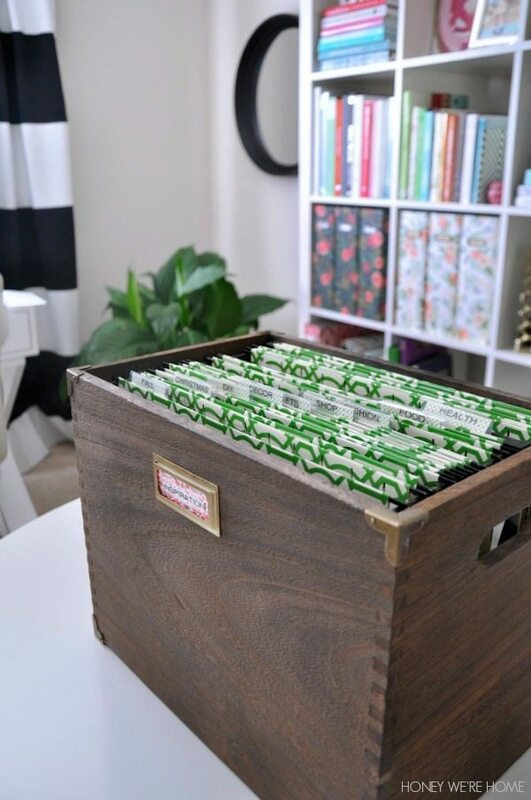 I found a perfect file solution at Target with a wooden file box and bright geometric green and white file folders. I sorted my magazine pages into categories with post-it note labels. How about a peek into my freshly organized office closet? It was quite the cluttered mess a few weeks ago, but I dug in and got her all cleaned up! I’m fortunate to have a built-in dresser with shelving above for extra storage, but I wasn’t taking advantage of that space and the stuff was just piling up. My craft paint, pens and brushes are now at my fingertips, which has led to a few more craft projects lately. Of course you can see why I’m excited about this makeover once you look at the before!